By Daniel Horowitz--Having recently celebrated its 50th anniversary, Toronto’s Bialik Hebrew Day school, located at Bathurst Street and Viewmount Avenue, has long-been synonymous with excellence in Jewish day school education. Founded by members of the Labour Zionist movement, including Ben and Edith Himel z"l, Viewmount continues to successfully engage an eclectic range of community members, providing them with strong connections to Jewish and Zionist values and an enriched academic environment. Fast forward to a new millennium and the year 2011, and it seems that everything old is, as the adage goes, new again. Made possible in large part to a generous donation from Irv and Mel Himel, the sons of Ben and Edith, the unique, successful and proven educational philosophy of Bialik will soon benefit Jewish children living in York Region, home to the fastest growing Jewish population in the Diaspora. When Bialik Hebrew Day School’s northern campus – the Ben and Edith Himel Education Centre - opens its doors on The Joseph & Wolf Lebovic Jewish Community Campus in September, 2013, it will be starting with a junior kindergarten, senior kindergarten, and Grade one class. Ultimately, the school will be able to accommodate 800 students and will include an Israel Interactive Centre, a fully equipped resource centre, an auditorium/gymnasium, an art room, and state-of-the-art technology. The 50-acre Lebovic Campus, located on Bathurst Street, north of Rutherford Road, is an initiative of UJA Federation of Greater Toronto’s Tomorrow Campaign, an unprecedented infrastructure initiative which is changing the Jewish landscape across the GTA. 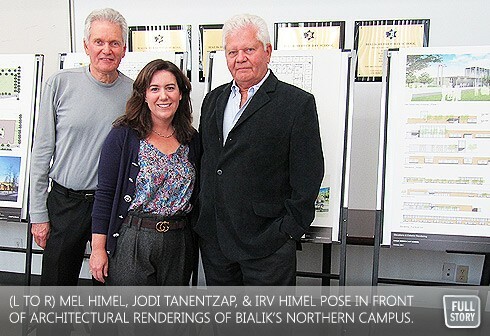 "My mother and father are smiling today, and they will smile even more the minute Bialik North welcomes its first students," said Mel Himel. "While there are many wonderful people throughout Toronto’s Jewish community who are committed to Jewish education, none of them are more committed than my father was. Our parents had many commitments in Jewish society, but their true passion was to Jewish education, Zionism and the State of Israel." "Our Board is absolutely committed to ensuring that the children of York Region have access to a Bialik education as soon as possible," said Mark Nightingale, Past President, Board of Directors, Bialik. "This is real. This is happening. We anticipate no problems with the site approval and plan to have the first shovel in the ground this spring. Though spaces are still available at the moment, our current pace of applications indicates the demand will exceed the space we can now afford to build for September 2013. Therefore community members have a unique opportunity at this moment. By investing here, they become leaders by directly increasing the number of kids in Jewish education. Together we are building the vibrancy of tomorrow’s Jewish community." "The fact that we, as a school, are able to replicate what our founders established 50 years ago, is incredibly exciting," enthused Shana Harris, Head of School, Bialik. "And, this will not just be another school opening, families in York Region will be getting a school with a reputation for academic excellence, for teaching Ahavat Yisrael, and inspiring Jewish values and mentshlechkeit. These pillars which, for the past 50 years, have been taught so successfully, now come with us to our new northern branch." Part of the academic excellence synonymous with Bialik includes a rigourous dual curriculum which includes the study of Hebrew, English, Yiddish and French. Bialik provides a nurturing and engaging learning environment that fosters growth of students’ academic, social and emotional skills. For decades, Bialik has sent a high proportion of its graduates onward and upward to high school at TanenbaumCHAT’s campus on Wilmington Avenue. Students who complete Grade 8 at Bialik’s new Northern campus will, quite literally, move across the street to the Kimel Family Education Centre, also on the Lebovic Campus, for a seamless and convenient transition. "My three children are all at Bialik and seeing, first-hand, the wonderful education they are getting there, and how their Jewish identity is developing, is truly remarkable," says Dr. Jodi Tanentzap, head of fundraising for the Bialik North Capital Campaign whose parents, community leaders Ed and Fran Sonshine have made a generous gift. "So, for me, being able to help bring that level of Jewish education to the children of York Region, and to see those families benefit from a Bialik education, is such a privilege." "We are absolutely delighted to welcome Bialik’s new, northern facility onto the Joseph & Wolf Lebovic Jewish Community Campus," said UJA Federation President & CEO, Ted Sokolsky. "When Bialik north opens its doors in 2013 alongside Tanenbaum CHAT’s incredible Kimel Education Centre, the strategic educational role of the campus in support of Jewish education will move to a whole new level." And, when asked just what his parents might say to him if they were alive today, Irv Himel, a man known as much for his sense of humour as for his generosity and vision, looked skyward, threw his hands up, and said: "They’d say, you never listened to us when you were a kid, but now we’re thrilled that our message apparently did get through to you!" Yes, Ben and Edith, it certainly did, and, as a result, the children of York Region will soon benefit.